1 3/4" x 1/2" general purpose labels by Prolabel. Light Blue attention getting color. Laser / inkjet Labels - Professional Label brand # B1705 with rounded corners. Standard adhesive. 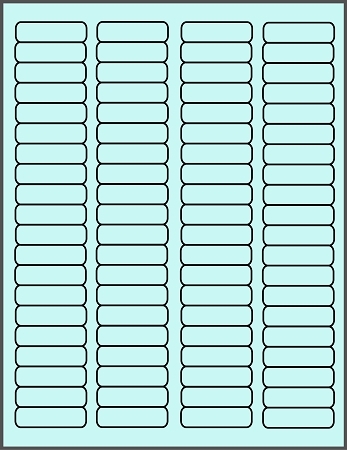 Eighty labels per 8 1/2" x 11" sheet. They match the 80 up sheets found in most popular software, and we also sell software with the template for these labels. They work well with laser or inkjet printers. Best results will come from laser printers. You can use Label Studio Pro, or Open Office to print these sheets, or use the free online printing EasyFast templates below.